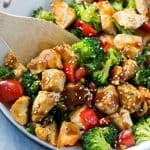 Teriyaki Chicken and Vegetables is an easy and healthy meal that's perfect for a busy weeknight! Homemade teriyaki sauce makes this dish, and you can use your favorite veggies! Place the soy sauce, water, garlic, ginger, honey, brown sugar and sesame oil in a small pot over medium-high heat. Cook for 2 minutes. Turn up the heat to high and bring to a boil. Heat 1 teaspoon vegetable oil in a large pan over medium-high heat. Add the broccoli and red peppers and season with salt and pepper. Cook for 4-5 minutes or until the vegetables have started to brown and soften. Add 2 tablespoons of water and cook, until water has evaporated. When your vegetables are crisp & tender, remove them from the pan and set aside; cover to keep warm. Wipe out the pan. Heat the remaining 2 teaspoons of oil in the pan over high heat. Place half of the chicken in the pan and season generously with salt and pepper. Cook for 3-4 minutes on each side or until cooked through. Set the first batch of chicken aside and repeat the process with the rest of the chicken. Add all of the chicken and vegetables back to the pan. Pour the sauce over the top and cook for 2-3 minutes over medium-high heat until warmed through.